From 1998 through 2007, Kevin James was the face of “just good enough” TV comedy. His CBS sitcom, King Of Queens, finished seven of its nine seasons in the Nielsen Top 40, never rising higher than the No. 21 spot. James’ portrayal of delivery driver Doug Heffernan earned the series’ sole Emmy nomination in 2006, but he lost the Outstanding Lead Actor In A Comedy Series race to Tony Shalhoub. The updated Honeymooners concept provided steady employment for the likes of Jerry Stiller and Patton Oswalt and made it possible for James to star in a series of films that, like King Of Queens, was commercially successful, largely inoffensive (I Now Pronounce You Chuck And Larry aside), and seemingly designed to run ad nauseam on basic cable. King Of Queens is the type of throwback sitcom that seems like it’s always on (and is nowhere near as bad is its reputation makes it out to be), even though it likely never inspired a great amount of passion from anyone who watched it. There are some compelling stakes in the financial reality of Kevin’s retirement, which isn’t necessarily the highest praise a sitcom pilot can receive. His wild fantasies of firing paintballs from the seat of a go-kart and quaffing free post-softball beers all hinge on finding a tenant for the family’s spare room, a search that’s complicated when Kendra shows up with Chale in tow. A sitcom family that can’t just wave away money problems is a primetime rarity these days, and the internal tug-of-war inspired by Kendra’s big surprise gives rise to the pilot’s few moments of sincere conflict. 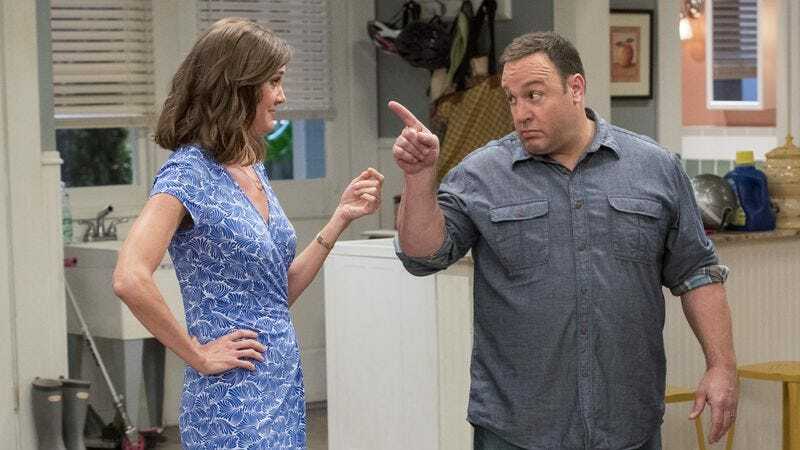 It’s also the type of conflict that’s easily shed as the series moves on from its pilot, and the minuscule amount of spin added by the budget crunch doesn’t hide the fact that Kevin Can Wait is a straight-down-the-middle sitcom pitch. The tensions between Kevin and Chale are as old as Archie and Meathead—or, in a callback to James’ old CBS gig, Doug and his eccentric father-in-law Arthur—but Kevin Can Wait’s teeth aren’t nearly sharp enough for its generation-gap jokes to draw any blood. The first episode presents Kevin as the type of guy who goes out of his way to help fellow cops and someone who can’t believe his daughter would fall for a cardigan-clad programmer with a lilting accent, but it can’t have it both ways. Unfortunately, a premiere episode about learning to compromise fails to find a satisfying middle ground. There are bright spots on the edges of the ensemble, none brighter than Erinn Hayes, performing her every-other-season tour of duty as a broadcast sitcom’s crossed arms and cocked eyebrow. In Hayes’ hands, Donna is only a partially damp blanket; her main function in the pilot involves keeping Kevin’s feet on the ground, but she does so in a way that doesn’t completely rule out the idea of Donna having some spark of joy in her life. She even gets to show that she can be as fun as the show’s responsibility-free day drinker, clowning around with a retirement gift in a scene that establishes a charming, playful rapport between Hayes and James. Those low-key moments are as good Kevin Can Wait’s first episode gets, and they’re probably as good as Kevin Can Wait can be. There’s still room for a modest comedy of this sort on CBS, but even in its limited ambitions, the premiere stumbles on undercooked dialogue and the garbled perspective of its protagonist. When one of its jokes manages to land, there’s a brief vision of a Kevin Can Wait that has something to say about unfulfilled promises, unexpected life changes, and the shifting priorities of millennials and the Gen Xers and baby boomers who raised them. But like its protagonist, the show is all too eager to sit back, crack open a cold one, and just relax. Retirement, says one of Kevin’s buddies, is “just okay—but the beer makes it great.” Kevin Can Wait itself is six or seven intoxicants away from greatness.